Damper holding tool for BB Chevy bolt pattern. Use this tool to hold the damper when using a damper with the 3.20 inch Chevy bolt circle. Designed for use with the ATI damper #917120 which has a BB Chevy bolt pattern. Made from heat treated tool steel, this damper holder works with a ½ drive breaker bar. Crankshaft Holding Tool. This tool bolts onto the crankshaft flange to hold the crank while installing the damper bolt. Fits either 6 bolt or 8 bolt crankshafts. Made from high strength, heat treated, steel. Use with a ¾ inch drive breaker bar. Crankshaft Holding Strap. Simple tool that can be used to hold the crankshaft in place when installing or removing the damper bolt. One end of the strap attaches to the crankshaft flange while the other attaches to the bellhousing flange. Tool fits SB, BB and Hemi motors. Fits either 6 bolt or 8 bolt crankshafts. Plate installs on water pump holes in block and allows the block to be pressure checked. If the cylinder head is installed then the block and cylinder head can be pressure checked at the same time. Kit comes complete with valve and gasket. A pressure gauge is optional. A torque plate is required to pressure check a bare block. The block should be filled with water when pressure testing to reduce the risk of injury and to help find any leaks. 30psi maximum pressure when testing! Too much pressure can ruin the block and may cause injury. Seal installer for wheel bearing seals. This tool is designed to install the inner wheel bearing seal for 1973 or newer brake rotors. Tool fits seal number 3580723. Tie down loops are designed to mount on most any Mopar chassis using the existing bumper bracket mounts. The AR1310 kit contains two brackets made from 0.188 thick steel. 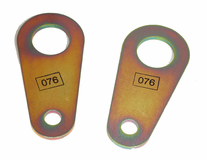 The brackets are zinc plated for corrosion resistance. Tie down brackets can be used at both the front and the rear of the car to secure a race car onto a trailer.